Hello there Here&Now readers. I'm Becky and I blog over at The Pumpkin Spot. Jess and I join forces monthly in the #BloggersWhoBudget collaboration and I'm flattered to be here today on her beautiful space. As you know, she is getting married (cannot wait to see the photos!) and then taking off for her honeymoon. While she is gone, let's discuss the short suit. One of my favorite looks right now is a drapey blazer over a pair of trousers or shorts. I wear scrubs to work, so I get really excited about work inspired pieces that transition to everyday wear. It's easy to do with the right products and looks pulled together and modern. Here's how I wore it. When J.Crew came out with these Pleated Crepe Shorts (on sale), I knew I had to make them mine. I prefer a looser fit on a short and these fit amazing. There are so many colors to choose from and they are really well made. I paired my shorts with this Chelsea 28 Layered Chiffon Tank. If you haven't scoped out this new line at Nordstrom yet, you must put it on your to-do list. The line is feminine, modern, and the price point is great. My blazer is from Madewell and it works with everything. The lean tomboy fit is perfect for layering with shorts, jeans, and just about anything hanging in your closet. Throw on your favorite pair of heels, grab a sleek clutch, and you are done. There you have it ladies, my take on the short suit! Many thanks to Jess for having me over today. Swing by my blog or tweet me and let me know your thoughts! This looks gorgeous. I love shorts in all forms. Great post! Thanks for having me over! Congrats and enjoy your honeymoon! love this look! those shorts are gorgeous! Love this whole look! What a great pair of shorts.... they look super chic! Love everything! That blazer... Adore. Love everything about this outfit! I might have to get that tank! This is gorgeous, I love how chic it looks! I've been eyeing these crepe shorts. Now I may have to get them! So cute. Definitely scoop them up. I'm thinking about getting them in blue esp now that they are on sale! They fit great! 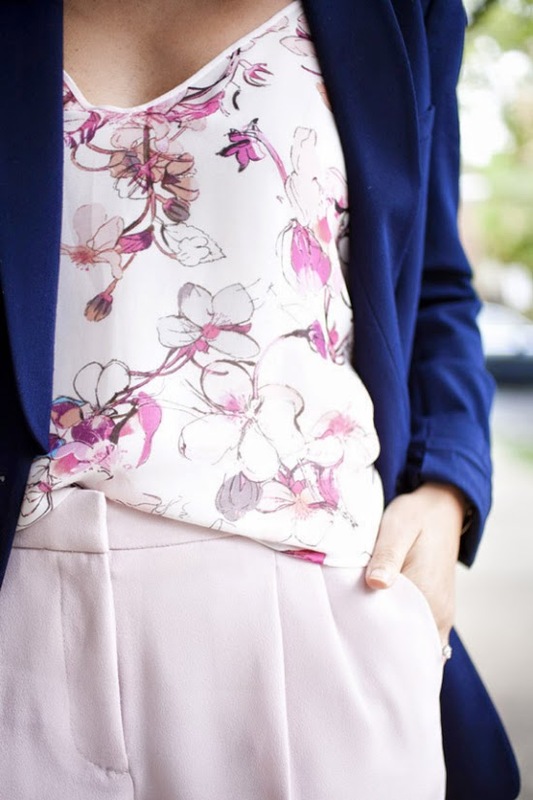 I absolutely love the combo of that navy blazer with the floral top!